In Knights of the Old Republic II, a motif of echoes and vibrations is woven throughout the narrative, particularly with regard to the Force, and to the actions of an individual. Many of the characters, from the fallen Jedi Kreia to the adorably psychotic assassin droid HK-47 voice notice of how the actions of an individual, a group, or something more metaphysical can create a cascade of after-effects- ‘echoes’, or ‘resonance’, as they are termed in the game. HK-47 comments upon how, by mistranslating a single word, an interstellar war between several insectoid species was instigated, and through this war the Republic was able to gain influence over an entire sector, shoring up the rapidly failing galactic government. Visas Marr, in her first scene with Darth Nihilus, mentions that she can “hear” the echoes of the Exile’s actions against the background noise of life in the universe. Kreia draws the Exile’s attention to the background hum of the Force itself on Nar Shaddaa, by listening with her heart- a method the Exile later uses to open the bounty hunter Mira to the Force. Many of Kreia’s lessons utilize the imagery of echoes and resonance to teach the Exile about the long-term, often unintended consequences of actions and ideas. Indeed, Kreia’s ultimate goal is to murder the Force itself through some complex utilization of echoes- to create an echo that would drown out the Force itself, to at last break its seemingly fickle will. In utilizing this language of echoes and vibrations, KOTOR II is playing on two concepts from Hinduism and Buddhism- Om and Pratitya-Samutpada, respectively. Om, in Sanatana Dharma (Hinduism), is roughly defined as the background vibration of the universe. It is the sound of all life, interconnected, acting and being acted upon. It is the totality of the unity of reality. A similar concept is the Buddhist idea of Pratitya-Samutpada, reputedly formulated by Siddhartha Gautama himself. Pratitya-Samutpada is the idea that everything in the universe is interconnected and interdependent- every person, every animal, every rock, every star, every action, every thought, every everything. In fact, the Buddha would argue that there is no such thing as a ‘thing’- that the concept of an independent, autonomous ‘thing’ is an illusion. Every action affects every other action in some way or another, no matter how great or small. Every act of being affects another act of being, which affects another act of being, anon and so forth. So, how does this relate to Obsidian’s 2004 combat RPG? Both Kreia and Yoda acknowledge the idea that the flesh- and indeed, to an extent, the independent self- is an illusion (maya, in Buddhist terms). The relevance of Pratitya-Samutpada in Buddhism is not only to understand the universe- it is to gain an awareness of how one’s actions have consequences, and are themselves the consequences of previous actions, and whose consequences will themselves have consequences. When she tells the Exile that her eyes would only distract her from seeing, Kreia is saying that her normal senses would only delude and distract her from comprehending hers and others’ lack of self, and their interdependence. Kreia’s plot in KOTOR II then takes on a new light. 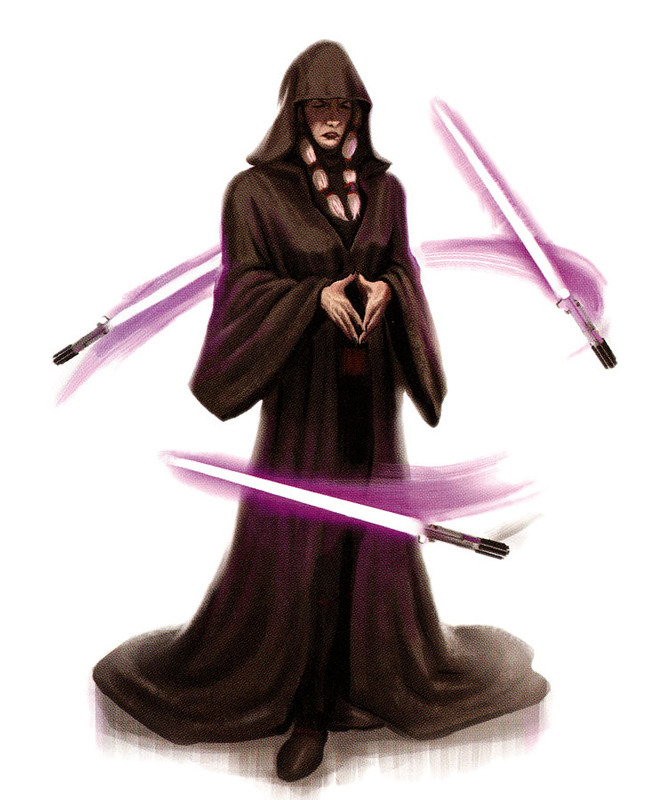 It could be argued that Kreia is a nihilistic Buddhist in a Daoist cosmos, acting on the concept of Pratitya-Samutpada to destroy the Force, which is (as I explained in an earlier article) the Star Wars version of the Dao. She has seized upon the idea that everything is interconnected and interdependent, she has listened to the background vibration of life and the universe, and thinks that she has found a way to turn that against the Force itself. The Exile is a tear in that pattern of echoes, and Kreia seeks to manipulate her and her connection to the Force in order to bring about a sort of feedback loop- to drown the Force in its self, to overwhelm it with its own totality. Her lessons to the Exile reflect not only an understanding of the totality of the oneness of reality, of the cause-and-effect of all actions, but a nihilistic rage against what she sees as the uncaring will of the Force. Kreia ultimately subverts the Buddha- where the Buddha suggests that Pratitya-Samutpada means that we should all love each other- as it is loving ourselves, as there IS no ‘other’ or ‘self’- Kreia seeks to use that oneness as a weapon against the Force.